The BFI recently issued a DVD/Blu-ray edition of Franz Osten’s classic 1929 film Shiraz: A Romance of India. The film tells the love story that lies behind the creation of the Taj Mahal and is accompanied by a new score by Anoushka Shankar, the daughter of Ravi Shankar and half-sister of Norah Jones. 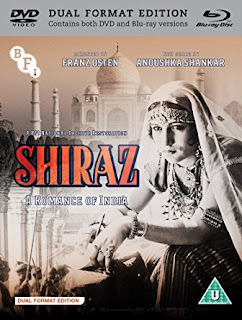 Included within the release are the short films Musical Instruments of India (1944), which was directed by Modhu Boses, and Temples of India (1938), directed by Hans M Nieter. I’m responsible for the sleevenotes for these two films, which are drawn from articles that I contributed to the Colonial Film project nearly ten years ago. My sleevenotes can be found here and here.